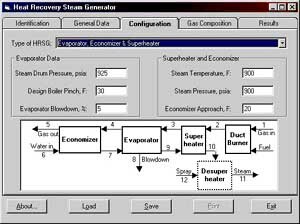 CU Services LLCm calculates the amount of steam that can be generated by a fired or unfired waste heat boiler (Heat Recovery Steam Generator). It features built-in steam and condensate properties. The system is designed to calculate a design mode and then an "off-performance mode" for changed conditions.